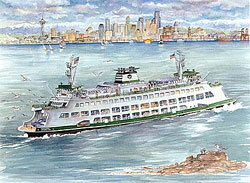 For over 30 years Sarah Clementson has painted the Northwest. 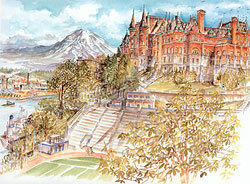 This extensive and highly popular body of watercolor work is available in limited editions and in note cards. Limited edition prints - minimum order 12 - comes with a display case. Notecards - minimum order 6 dozen. Refrigerator Magnets - minimum order 4 dozen. Washington State playing cards - (54 images) minimum order 24, comes with display. 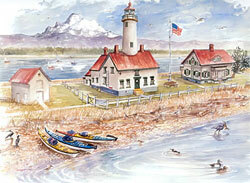 Annual Wall Calendar - minimum order 1 dozen. Advent Calendar - minimum order 1 dozen. Boxed Christmas cards - minimum order 10 dozen. Payment is arranged over the phone (360 697 7968), terms net 30. For custom orders, such as color matts for limited edition prints (3 colors to choose from) contact Sarah or Michael at 360 697 7968. Sarah's work sells best when the complete product line is displayed. 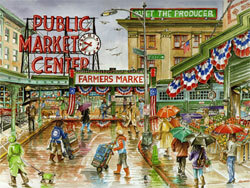 To find out how to become a Seattle Watercolors Wholesaler call (360) 697-7968 or fill out the contact form below.